We started our sightseeing with this great structure. Associated legend is that once Lord Ganesha ate too much and to protect his tummy from bursting, he tied a snake around it. This structure is carved out such that snake is visible on Lord’s tummy. As most of the people start their tour from this place, Site map of Hampi is also installed here to assist the tourists. 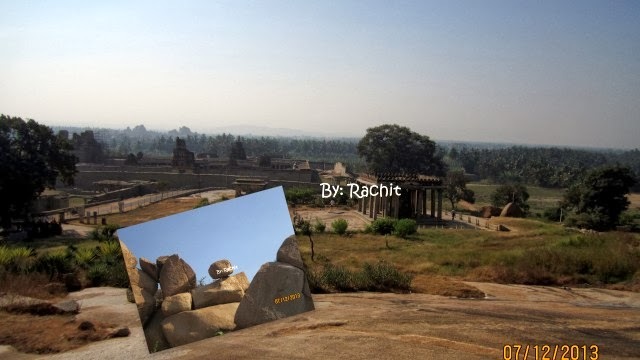 This place is built in very large area and if you will explore the place, there are also some Jain temples nearby and also , you can also go to Hampi tower as they are connected from behind. I must recommend you to at least go to the top as one can get a very good view of Hampi. Please refer some pictures that I am sharing. This temple was built by the King Krishnadevraya to push the boat out in memory of successful conquest of the kingdom which is referred as Orissa presently. King brought the idol of Balakrishna (Lord Krishna as a child) and installed it here, however not the idol is shifted to museum of Madras. One strange thing I noticed that there is no idol in any temple in Hampi except Virupaksha. All the idols were now shifted to different museum where they are more safe, to preserve the culture and history. The walls of the temple are adorned with some very exquisite carvings. This temple is also in very dilapidated state like other structures of Hampi. Some construction was going on when we visited the temple to prevent it from collapsing. Outside the temple, you can see the huge hall like structure which was once the happening Market of the era called as Krishna Bazaar. It is evident from the structures that it was kind of Market. Halls were built the way we can see the vendors in any fair and exhibition. This was a nice place and we spent quite a good time here simply observing the place.The best part was that nobody was here except for 2,3 people. Hampi is a kind of place where in some of the sites, you feel that there is no else in this world, they are acutely desolated. This looks very splendour and exotic and is used by the Queen’s to take the bath. As soon as I saw this, the song “Is Reshmi Paazeb Ki Jhankar” from the movie Laila Majnu came to my mind where the actresses take the bath in similar striking pool. This place can be compared with the best of Spa’s of this age. It would be difficult for me to explain the grand structure of this place which is also the engineering marvel of that era showcasing the talent of craftsmen of that era who took care of inflow, outflow, and sewage and also heating the water naturally and so on. It is believed that queen used to take bath with the assistance of other ladies/servants who also used to throws flower from the top. Such majestic baths can be found at many places in India, for example Red fort is one of them. Though the structure is now in very dilapidated state and one can imagine its charm when it was alive. Guess what? I have never been to Hampi. And glad to connect with you on Twitter. Thanks for your taking out your precious time to comment. It is truly an honor for this blog to get the comment from you who topped the list of top travel bloggers of India. Its really unbelievable that you have not visited Hampi.Anyways nice place. Do visit. Even i am glad to connect with you on twitter.